Omg these flourless chocolate pumpkin cookies just might be my new favorite pumpkin recipe this season! 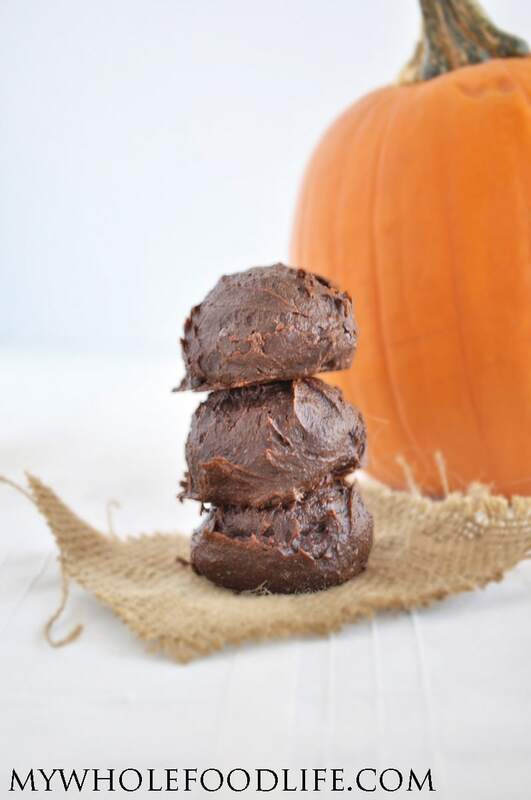 I know I said that about my paleo pumpkin pie cupcakes and my pumpkin truffles, but these flourless chocolate pumpkin cookies are amazing too! I guess I just really love pumpkin recipes! Especially when they are healthy pumpkin recipes. The best part about this recipe? It only contains 6 simple ingredients! Not only do these healthy pumpkin cookies contain no flour, but they also contain no refined sugar either. No mixer needed to make this super easy recipe. These pumpkin cookies are vegan, gluten free and paleo. If you need a nut free version, you can probably use sunflower butter or pumpkin butter. A soft and fudgy cookie that is secretly healthy! Mix all ingredients, except the chocolate chips in the food processor . Once smooth, add in the chocolate chips and pulse a few times to mix them. Once the mixture is firm enough to scoop, drop cookies onto a lined baking sheet . I used a cookie scoop for my cookies. These cookies are soft with a fudge-like texture. Store them in the fridge. They should last a week. You may also be able to freeze them, but I haven't tried. Enjoy! Hi there! I love these cookies. I am now on the Autoimmune Paleo protocol and don't get to have cocoa powder or nut butters. Carob is an easy substitute for the cocoa powder. Any ideas for substitutions for the nut butter? I have coconut manna and gelatin... Thanks! Can you have sunflower butter? Not currently... No nuts or seeds. And I really love nuts and seeds! We have leftover pumpkin puree after occasionally making pumpkin pancakes, and the remaining puree tends to get forgotten about. Always mold. Now that I have made these indulgent truffle-like cookies that were devoured (before as well as after baking) by my kids and me, moldy pumpkin puree will be a thing of the past in my household! Thank you for sharing! Can I sub the cashew butter with peanut butter? Yes, but the peanut butter flavor may come through more than the pumpkin. Thanks. I tried it and I mostly just taste the cocoa powder. Hi. Can cacao powder be used in place of the cocoa powder?